Summary: As my family begins its journey from California to the Heartland, our leaders – in a burst of bipartisanship – condemn Trump’s attempt to stop Cold War 2. CW2 is a conflict in which we have nothing to gain, based on lies, and risks nuclear war. It is the best demo yet that our political system has broken. Naturally, since we (its key component) are MIA. We can fix this at any time. By Maximilian Forte, Professor of Anthropology. From Zero Anthropology. Posted here with his generous permission. Finally, on Monday, 16 July 2018, the Helsinki Summit bringing together Russian President Vladimir Putin and US President Donald Trump took place, despite shrill demands that it be stopped, canceled, or turned into a platform for more aggression. “President Trump should cancel his meeting with Vladimir Putin until Russia takes demonstrable and transparent steps to prove that they won’t interfere in future elections. Glad-handing with Vladimir Putin on the heels of these indictments would be an insult to our democracy,” Senate Minority Leader Chuck Schumer said. Yet there could never be any “proof” of someone not doing something in the future, and to implement the conditions for this specific case would require turning off all the electricity in Russia and seizing all computers everywhere on its territory. It is thus plainly an absurd, irrational, and unrealistic statement that is meant to satisfy partisan emotional needs. As a recipe for international relations, it would be a disaster of a policy. What united all of the US media, from Fox News to CNN and right across to MSNBC, was the dominance of the America-the-innocent-victim narrative. Joining them was an established band of encrusted “neocons” such as Senator John McCain who asserted, in the usual evidence-free fashion of the kind that brought the US to Iraq, that Putin was guilty of “ongoing aggression towards the United States”. The “no blame” narrative (that permanently shields Americans from the consequences of their actions) was joined by the insistence that the secret police and espionage agencies should just be believed, without doubt, and that such agencies should have primacy over democratically elected representatives. Funny that this is what should issue from the same mouths that claim to warn us against “fascism”. However, in an amazing press conference featuring Putin and Trump at the close of the summit, virtually everything the Democrats, their neocon associates, the media, and the military-intelligence establishment did not want to hear, is what they were instead forced to hear. Allegations of “collusion” between Trump and Russia faced thorough embarrassment as utter idiocy. Putin tossed back allegations of Russian interference in US elections, and essentially laughed at the bogus “assessment” that has been treated as if it were sacrosanct truth in the US media, such that Trump was expected to perform an auto da fé in front of the new Cold War media’s Grand Inquisition. There was no hint of Russia withdrawing from Syria (there at the Syrian government’s request) – though Trump reiterated the near total defeat of ISIS that had been achieved, which also eliminates the US’ rationale for its illegal intervention in Syria. Russia refused to accept that Crimea did not legally, peacefully, and democratically choose to join Russia, to which it belonged for the majority of its history. On these and other issues, it was as if a stake had been driven through the heart of the new Cold War. Of course, it was also just a beginning, and not an end. In an interview with Fox News’ Chris Wallace, Putin said that the Helsinki Summit was simply “a good start” to ending a revived Cold War that significantly endangered the world. Trump also said that US-Russia relations had reached a disastrously low point, without precedent, and that had ended with the Helsinki Summit. This was an important diplomatic breakthrough, and a legitimate success. Then how was it turned into a moment of infamy in the US? Just how deep is the addiction to empire? Any student of international relations will know that such summits leave as little room as possible to spontaneity and chance. Instead, they are preceded by officials meeting and corresponding behind the scenes, in planning the event weeks and months in advance. They collaborate in drafting an agenda, and preparing the process of formulating and articulating what could become points of agreement, to be ironed out when the leaders meet in person. That was true of the Helsinki Summit as it was true of the Singapore Summit, as it has been true of all other major summits in the last three centuries of international diplomacy. The notion that Donald Trump would somehow be “winging” this and that the meeting could produce a “surprise” is something entertained by either those who do not know better, or those who pretend to be ignorant. The fact of months of preparation was confirmed by Vladimir Putin himself, at the opening of his interview with Chris Wallace of Fox News on the evening of the summit, July 16. Unfortunately the media completely missed the significance of these statements. As such, what Trump did in the lead up to the summit was to begin to widen the path for his point of departure. Speaking of trade relationships with “allies,” days before the Helsinki Summit Trump stated: “Sometimes our friends, when it comes to trade, are treating us worse than the enemies”. A day before the Helsinki Summit, Trump told a journalist that, “I think we have a lot of foes. I think the European Union is a foe, what they do to us in trade. Now, you wouldn’t think of the European Union, but they’re a foe”. Trump’s European counterparts seemed to understand what was coming too: some officials confessed that, as the NATO gathering approached, they were “scared shitless” by Trump. Leon Panetta claimed that the Europeans were “scared to death” that Trump would seriously act on his “America First” strategy. Being “absolutely worried” seemed justified, as NATO members had no good arguments for maintaining NATO and for perpetuating what some astute analyses saw as an obsolete and abusive relationship. On his way to the NATO gathering in Belgium, President Trump said this about the alliance and how it benefited allies: “Frankly it helps them a lot more than it helps us”. The divisions dominating NATO, since Trump took office, were now apparent to anyone willing to pay some attention. Predictably, The Economist voiced the outcry of liberal imperialist elites for the waning NATO alliance, astonishingly touting it as an anchor for democracy – this, despite all evidence to the contrary, particularly NATO’s disastrous intervention in Libya, and the corrupt and rigged elections which it supervised in Afghanistan. The argument one could not credibly make, is the one about NATO as a support system for democracy. Moreover, the manner in which NATO is upheld, against the wishes of citizens in its member states, who are tired of NATO’s incessant war agenda, and the way NATO leaders try to delegitimize democratically-elected leaders, blasts more holes into the democracy illusion advanced by NATO’s elitist apologists. Indeed, democracy is in decline even among NATO members themselves, albeit according to some questionable analyses. Either way, democracy is the last argument one should ever make in defense of NATO, and is easily one of the worst arguments. As for the notion that the military is the supreme guardian and supervisor of democracy, that is better left with the likes of General Augusto Pinochet and other legitimate “fascists”. The really significant moment, misinterpreted and misunderstood in every article I have read, concerned Trump’s comments on Germany. Trump expressed acute condemnation of Germany, going as far as calling it a “captive” of Russia, in language evocative of Russiagate conspiracy theories. For those who would use Russiagate conspiracy theories against Trump, provoking a new Cold War, Trump seized on their contrived fears and turned them against the fear-mongers. Some argued, with considerable merit, that NATO itself has helped to cause a new Cold War. Trump’s harangue against Germany’s agreement to be connected via a gas pipeline to Russia, pointed to the German government’s hypocrisy – in demanding the US remain committed to the defense of Germany, presumably against Russia, while doing business with Russia. Implausibly, the German response was that the two matters were separate. Seizing on this contradiction, and using it for his own purposes, Trump himself said this: “I am meeting with President Putin next week and getting along – let me tell you, getting along with Russia and getting along with China and getting along with other countries is a good thing. It’s not a bad thing. It’s a good thing”. Indeed, Trump later altered his message, saying the pipeline deal would not be so bad, if NATO states improved their relations with Russia – which seems to have been his larger point, one that both undermined the new Cold War and NATO’s very own reason for being. As for why Trump is doing all of this, right now, so far the lone genius in the story who has correctly discerned the forces producing the pattern, is the eccentric and entertaining Max Keiser. How Trump used the new Cold War and its Russiagate conspiracy theory rhetoric against its own purveyors, calling out their hypocrisy and then attaching a price to it, seems to have been missed in most analyses. It was a particularly deft move, similar to his holding neoliberals hostage to their own free trade rhetoric (while they practiced less-than-free trade). In this as in other instances, Trump proved to be more clever than many of his professional critics. Taken together, all of these positions are united by their divergence from the status quo ante, the neoliberals’ dream of a New World Order, of a “transatlanticism” that married Europe and the US in an imperial alliance that sought to command, and thus exploit, the rest of the planet. In the US, it repaired the apparent belief among neoliberals of the right and left that the political system is one where the FBI/CIA rule at the top, and the President is second. The US’ foreign policy establishment, and specifically the military-industrial-complex, had been alarmed at least since 2016 that Trump, in seeking to improve relations with Russia, would yank the rug out from underneath their lucrative anti-Russia scare-mongering. True to form, just three days before Trump would meet with Putin and in an obvious attempt to “pressure” Trump, Deputy Attorney General Rod Rosenstein issued an indictment alleging 12 Russian operatives had attempted to interfere with the US election of 2016. Not facing a realistic prospect that these 12 individuals would ever appear in a US court, the alleged evidence against them would never be tested – the easiest indictment to make, as Glenn Greenwald put it. Under the rules of due process, it also means such operatives were innocent, simply because they had yet to be proven guilty. One can also wonder, if one wants to pretend being naïve, whether the US would ever fork over its intelligence agents if they were indicted by a foreign state. Of course an onslaught of alarmist, anti-Russia and anti-Trump hyperbole vented from the US media once more, as if oblivious not only to popular distrust of the same media, but the incredible fatigue over everything constantly being likened to Pearl Harbor. Absurdly irrational contradictions continued – the Russians apparently stole DNC emails, and then spread “fake news”. Except both of those statements cannot be true at the same time. Either the news was fake, or the emails were real and thus dissemination of their contents was real. Clearly Rosenstein, with the aid of the FBI’s Bob Mueller, was intent on destabilizing Trump’s government and specifically its authority to conduct foreign policy, employing a transparently cheap political stunt that casts Mueller in the worst possible light. (The move backfired somewhat: almost immediately it was announced that Rosenstein would face impeachment, while Trump pointed out that the alleged Russian interference occurred under Obama, which did nothing to stop it.) The indictment also came just one day after a scandalous performance by the FBI’s Peter Strzok in front of cameras in an open Congressional hearing, revealing the level of corruption, bigotry and bias permeating the highest levels of the FBI. Strzok successfully caricatured himself as the classic fascist secret policeman. Meanwhile, Rosenstein’s opportunistic and futile indictment not only failed to present any new information, it left out a great deal about how Republicans were also allegedly targeted. If the Democrats and the media only suggested opposition to Donald Trump’s summit with Kim Jong-un a month before, they both came out openly against any meeting with Vladimir Putin. In the two days leading up to the event, there were shrill demands that the meeting be canceled outright. As such, the Democrats and their media were sealing their fate as the party of imperialism, the party of the Cold War, and the party of the past. Their denunciations of diplomacy served as a reminder of why they deserved to lose the 2016 elections. Most of the Republicans quoted above are “never Trump” has beens, on their way out of electoral politics because they became so unpopular with constituents, or are no longer involved in elections. The never Trumpers are boiling at their collective failure, having been driven from the Republican Party and thus no longer in a position to dictate its agenda. Like other exiles the US has hosted, they are determined to carry out regime change from another shore. “Russia’s aggressive actions in the Crimea and Ukraine have brought about a situation where President Obama and NATO – correctly, I believe – are saying we’re going to beef up our troop level in that part of the world to tell Putin that his aggressiveness is not going to go unmatched. We have to work with NATO to protect Eastern Europe against any kind of Russian aggression”. But what did these people seriously expect of Donald Trump? Did they imagine that President Trump would essentially invalidate his own electoral victory, stripping it of all legitimacy, by affirming that the “Russian collusion” stories were what they are patently not, i.e., serious, credible, evidence-based, truthful representations of reality? Apparently the “logic” at work among his critics is that if Trump fails to agree that his election was the result of a Russian conspiracy, then that means he is the agent of a Russian conspiracy. Otherwise Trump’s “failures” at Helsinki appear to have been that, (a) he was critical of American spies and secret police, and, (b) that he was diplomatic toward Putin. By criticizing American agencies, Trump diminished the American claim to perpetual victimhood. The US is in the grips of a generalized fever, ruled by a panic that privileges “victims” and which constructs victims everywhere one looks. Trump thus challenged the prevailing fiction that America was without any blame – and here Trump was making a major break with his own narratives. His critics denounced the “moral equivalency” implicit in his remarks at the Helsinki press conference, which is a familiar complaint of American exceptionalists who have long been trained in the arts of hypocrisy and decontextualized self-representation. Speaking of hypocrisy, Trump’s Democratic critics persisted in their failure to explain what their “reset” with Russia would have looked like, if the little that Trump did so offended them. What exactly did Obama mean in 2012 by his otherwise clever retort to the hawkish Mitt Romney, “the 1980s called and they want their foreign policy back”? Worse yet is the glaring contradiction between opposing an economic Cold War with China, played out on the field of trade, while proposing to escalate a Cold War with Russia. What sort of globalism is that? “Globalization has transformed American universities into a front line for espionage,” argues Daniel Golden, author of the recently published book, Spy Schools. However, The New York Times, having energetically fanned the flames of anti-Russian hysteria and xenophobic paranoia, it now accuses the Trump administration of doing just that, only with reference to China and Chinese researchers on US campuses who may soon face tighter restrictions in gaining access. What media elites obfuscate, of course, is that deglobalization is increasingly a fact. Whether the favourite target is Russia (for Democrats) or China (for Trump’s Republicans), either way the logic, means, and outcomes are the same: diminished international cooperation at the heart of the globalist ethos. On the other hand, whether they admit it or not, the Democrats (and the EU) are fully on Russia’s side in defending the Iran nuclear agreement, which Russia upholds and which Trump abrogated. How do the Democrats explain this rather strange overlap in interests? Are they secretly colluding with the Kremlin to support Tehran? Would not the Uranium One deal exposed by the New York Times be further evidence of such collusion? When one lowers the threshold for rational thought, the way critics of Trump have done, then any old crazy talk should suddenly sound plausible. Trump’s critics also expected him to shame and berate Putin, escalating tensions to the breaking point, in what would have been an unprecedented scene of personal aggression on the diplomatic stage. Yet recall how utterly charming and amiable Vice President Richard M. Nixon, an arch anti-communist, was when he publicly met with Soviet Premier Nikita Khrushchev during the famous “kitchen debate”. Trump was hectored for merely shaking hands with Kim Jong-un, taken as a sure sign that he “loves dictators”. The question then becomes: with a domestic opposition so ostensibly debased and pathological, who wouldn’t love foreign dictators instead? In an interview with Larry King, Russia’s Foreign Minister, Sergei Lavrov, outlined the issues of importance to Russia – these ranged from a strong critique of the West’s humanitarian imperialism, to its double-standards on the popular referendum in Crimea that saw its Russian majority choose to join Russia (there was no “invasion”), to the continued threat of NATO expansion. Lavrov specifically cited NATO as an “atavism of Cold War times” and criticized the “inertia of Cold War thinking” that dominates the West. As for the much touted “rules based international order,” Lavrov correctly pointed out that it was built on Western double-standards that allowed the US to flout international law with impunity and live by a separate set of norms. Separately, the Kremlin spokesperson, Dmitri Peskov, pointed out that it was not Russia that was responsible for initiating the deterioration in relations, and that the US seemed to particularly resent that Russia would not simply bend to its will like a dependent puppet state. In advance of the summit, Peskov made some very reasonable and basic observations on the need for peaceful cooperation, while each state should safeguard the interests of its own citizens. There was nothing here indicative of the fabled Russian “aggression” that seems to preoccupy the shrill, imperialist “resistance” in the US. But then rational, critical, independent-minded thought is not allowed. We are instead plunged into a free fall to new depths of distortion, exaggeration, and outright invention. Thus in the US media and political circles (the two being virtually indistinguishable), it has become a matter of fact that “Russia invaded Crimea”. Do they mean like the US invaded Iraq? Fine. Then it should be a very simple matter for the reader to find us photographs and videos of Russian columns pouring into Crimea, seizing buildings, and engaged in gunfire. Also, remind us of the body count resulting from Russia’s “invasion”. The actual reality is that Russia neither invaded nor annexed Crimea, not if words are to have any meaning at all. Acceptance of the notion that Russia invaded Crimea indicates that one is already prepared to accept any sort of fabrication as if it were fact. Nothing has apparently been learned from the great WMDs myth of 2003, except how to repeat it and amplify it. This involves a deeply perverse commitment, and there is no point railing against “alternative facts” when all you do is recite alternatives to facts. And what exactly is “the solution” to Crimea? Is it about forcing the majority of Crimeans to subjugate themselves to rule by a government that has resolutely persecuted Russian communities within its borders? What sort of idea of justice is this exactly? Let us not forget how that government came into being in Ukraine, which was through a Western-backed coup and violence in the streets, and which has also witnessed the rise to power of actual neo-Nazis. Then there is the assertion and easy acceptance of the fabrication that Russia aided “the Syrian regime” in its “chemical weapons” attacks on civilians. What chemical attacks? Has the reader noticed the almost total silence in the media about the facts actually found on the ground? After the US, France, and the UK used a “chemical attack” as a justification for attacking Syria, Western media largely ignored the facts that were revealed by the Organization for the Prohibition of Chemical Weapons, tasked by the UN to conduct an investigation. In a July report, the OPCW stated that it had found “no organophosphorous nerve agents or their degradation products were detected in the environmental samples or in the plasma samples taken from alleged casualties”. That it called the casualties “alleged,” meant it also found none. No nerve agents, no casualties. Again, let me ask: what chemical attacks? Like the Iraq WMD myth, once again Western governments and media perpetrated egregious lies against their own citizens, to justify acts of unlawful military aggression. How many more times do we need to repeat this before you finally learn the lesson? This is a very serious question, because what is being challenged here is your human capacity to learn, and to remember what you learned. We are also told that Russians subverted US elections. If it had been true, how would you have been able to spot their subversion among all the other subversion? Here I am referring to the persistent subversion of American politics by giant corporations and oligarchic financiers, and of the pervasive influence of the military-industrial complex, to the point that US elections risked degenerating into mere demonstration elections staged by the corporate imperial state, not to mention an impressive array of foreign donors (recall the Clinton Foundation). Logically, the only way one can “subvert” something that is already corrupted, is by fixing it. Repeatedly we have been instructed that all of the US’ intelligence agencies concluded that there was significant Russian interference in the US elections of 2016. First, it would be useful to consult the resources on Russiagate compiled on Fabius Maximus. Second, it is important to remember that: “The intelligence community as a whole has not been tasked to make a judgment and some key members of that community did not participate in the report that is routinely cited as ‘proof’ of ‘Russian interference’,” as explained in careful detail by Jack Matlock, a veteran of government service with experience on national security matters at the highest levels. Remember that US media such as the New York Times have been forced to withdraw statements that all of the US intelligence agencies reached these so-called conclusions about Russian interference, not to mention all of the other “fake news” actually produced by CNN, The Washington Post and others on Russiagate. Third, recall that veterans of US intelligence agencies openly challenged claims that Russians hacked the emails of the DNC. Even this short list should, in the mind of any reasonable adult, provoke at least some misgivings. That Vladimir Putin should publicly assert, as he did on July 16, that the Russian state has no compromising information about Donald Trump, should have put an end to that story. Why? Simply because if in the future the Russian government should purport to have any such information, it will have been contradicted and thus invalidated by Putin’s prior statement. There is no point in having compromising information, if you challenge its very existence at the outset. Case closed. Yet, we are instructed that Russia is “untrustworthy”. What makes it so unworthy of trust? The real problem about Russia is twofold. One is that Russia has been cynically exploited by Americans which have used Russia as a cheap political football in their domestic conflicts. The second problem is that Russia is the kind of state that does not immediately bend its knee to Western demands. What Americans describe as “trustworthy” is exactly what describes a puppet, an instrument that bends to the American will. It is thus not terribly flattering to have an American call you a “trusted partner”. What especially irks Americans in the foreign policy establishment is that Vladimir Putin is an obviously brilliant statesman, and that Russian diplomats have bested their Western counterparts for decades, both in their expertise and professionalism, and in their deep appreciation of international law, sovereignty, and self-determination. These are all qualities to be detested. In the interview with Wallace, Putin provided a short list of Russian complaints, that rarely get aired by the US media: NATO’s relentless expansion eastward, even after the Cold War had ended, and in violation of promises to Russia in return for its agreement to allow the reunification of Germany. Added to this is the US’ unilateral withdrawal from the ABM Treaty. Then added to that was the US and European intervention in Yugoslavia, participating in its illegal breakup, and then backing a coup in Ukraine. While freaking out about some emails and Facebook ads, compare it to that list and see which side weighs more. That Putin should end his interview with Wallace by pointing how US sanctions on Russia have backfired, producing only opportunity for the US’ competitors, is not a simple demonstration of his concern for Americans. It is a reminder to the viewer of just how stupid we have become. A Bad Day? For Whom? Probably the single most important achievement for Donald Trump arising from the Helsinki Summit, is that he forced fellow Americans to begin to debate what was previously treated as unquestionable, to debate that faith which has been masked as “facts” and which are used to create a sacred aura around the upholders of empire. Trump’s supporters will be divided between those who supported Trump while they thought they could use him, and his genuine supporters who elected him because of the principles he advanced in the 2016 campaign. We can look forward to some interesting and embarrassing contradictions. Fox News has a privileged relationship with Donald Trump, but also an ambiguous and contradictory one that contains a lot of latent conflict (hopefully an intelligent study by a calm media analysis scholar will eventually bring this out better). Emblematic of this privilege, Fox News monopolized all of the key interviews arising from the summit: Chris Wallace was granted an exclusive interview with Vladimir Putin; at the same time that was happening, Sean Hannity was interviewing Donald Trump; thirdly, this was to to be followed up by Tucker Carlson’s interview with Trump, to be aired on July 17. Sean Hannity, who until now has been an unquestioning supporter of President Trump, never expressing even the mildest of reservations, is also a close friend of Newt Gingrich who appears frequently on Hannity’s show. Gingrich condemned Trump’s statements in Helsinki. Hannity was apparently unaware of this when he scorched all of Trump’s Republican critics. Hannity’s “Opening Monologue” for July 16, just hours after the summit ended, seemed to show someone who was unable or unwilling to digest what had just happened. Hannity was full of contradictions; he continued, like a broken record, to repeat content that is now many months old; and he praised Trump, but in the way that a neoconservative would, touting Trump’s “toughness” on Russia and belligerence toward Iran, North Korea, etc. Meanwhile, people commenting under Fox News’ reports on the summit are for the most part firmly in support of Trump’s stance at the summit, condemning the neocon elites ousted from the Republican Party. Fox, for its part, has largely tilted against Trump – they risk bringing the relationship with Trump back to what it was in late 2015, when Trump’s arch enemy in the media was not CNN, but Fox News. How some have forgotten already. Trump went as far as boycotting and then upstaging a Fox News Republican primary debate. Since Fox decided to repair relations with Trump, it has tried to use him as an instrument: knowing they have his ear, their commentary has consistently pushed the old neoliberal imperialist orthodoxy, trying to preserve the interests of the status quo ante, while reducing Trump’s ascendancy from a structural shift to a mere partisan switch. All of Fox’s contributors, virtually without a single exception, all presumed to advise Trump from a distance, to treat the meeting with Putin as something like a boxing match and to make sure to bloody Putin’s face. Fox failed. It is actually worth relishing how solidly and totally they have been ignored. Trump is definitely not a politician, or he would not show this much courage. Seemingly aware of this himself, Trump’s opening comments at the joint press conference with Putin at the summit indicated as much, saying: “I would rather take a political risk in pursuit of peace, than to risk peace in pursuit of politics”. By politics he clearly meant partisan status and security. What was especially significant about the Helsinki Summit was not so much anything either Vladimir Putin or Donald Trump said, as much as the hyperbole of knee-jerk reactions – excessive even by American standards – involving a growing, collective, high-pitched scream coming especially from displaced liberal imperialist elites who have still not come to grips with their loss of the US presidency. Witnessing the reactions to the press conference that closed the summit afforded a special, rich, and just pleasure to those of us who just a few years ago saw today’s screamers pompously preside over the razing of Iraq, the military colonization of Afghanistan, the destruction of Libya, and the dismantling of Syria, all while cheerfully preaching the virtues of a neoliberal world “order” that saw the biggest wealth transfer ever recorded in human history. What they did not steal abroad they robbed at home. It was about time that they had (another) bad day. And it was indeed a very bad day – a bad day for the conspiracy theories pushed by the Democrats, their neoconservative bed partners, and the corporate media who are the instruments of power. It was also a bad day for the interests vested in the way things were before, who had poured hundreds of millions of dollars into the failed campaign of their would-be stewardess, Hillary Clinton. And, it was an especially bad day for orthodox, imperialist reactionaries who in the US gesture as progressives and garb themselves as “the resistance”. These are the same forces that would claim monopoly ownership over “respectability,” “reason,” and “decency,” assuming in turn that the rest of us suffer from a collective amnesia as deep as our generous credulity. If one could rewind and replay a day, then July 16, 2018, was the day worth recording. To better understand what happened at Helsinki, it is useful to follow the trail of tears to its sources. What took a big blow were the interests of self-styled “transatlanticists,” the elites of a transnational capitalist class that has ardently preached the virtuous necessity of neoliberal empire. This is the class, with all its “responsibility to protect,” its “humanitarian intervention,” and its projects of regime change. We are speaking of here are the stalwarts of failure, the abiding defenders of the New World Order which has collapsed in front of their eyes. Keeping this in mind, one sees the pattern that joins the seemingly disparate dots that have dared, in the face of their popular repudiation at the polls, to condemn Trump for moving toward what he promised. How the imperial national security state will let this stand, is to be seen. Previous Post Americans are angry! Is it helping? I cannot find pleasure in Trump’s strange and often appalling behavior. The elites of both parties richly deserve a comeuppance, but superior governing and connection to the needs of the poor and middle classes would be preferred over the wrecking ball that is Trump. His attack on the elites is not targeted, and as a result, he destroys what is worth saving alongside that which is corrupt. Shorter but along the same lines. Professor Forte’s post is more detailed. It made my morning. I was looking forward to a post on FM about the summit but knew I’d have to wait. I also knew it would be worth the wait. This post along with your RussiaGate material has been invaluable. Because what I discovered that day was that I intensely dislike people who make my country look stupid. The screaming, gibbering, and flinging of feces that greeted that press conference gave me that same sense watching something so stupid that you actually felt embarrassed just to be there looking at it. And the dumbest thing I’ve heard yet is that Trump shouldn’t have met with Putin because he’s a tyrant/dictator/supervillain, or what have you. Correct me if I’m wrong, but didn’t FDR meet with Uncle Joe Stalin? Should we have impeached FDR for it? Russian leaders are not normally candidates for sainthood, but there is a certain amount of business we need to transact. This comment is already too long, so I’ll say this and I’m done. Somewhere in the Federalist papers, I think there’s a statement that a President can be impeached for failure to check the excesses of his subordinates. To the extent that Donald Trump is guilty of an impeachable offense, it’s for tolerating the likes of Peter Strozk and his contempt for the elected representatives of the people for five minutes. It’s not too long for me! Although I will say, having once been a cashier, that young lady was likely concerned that if she accepted improper ID she could be fired and even charged for lost merchandise. And there’s no way her training covered whatever that red passport was. Excellent write-up. Thank you for publishing content such as this. I’ll add something to what I said, and I hope I’m not taxing Larry’s patience by doing so, something I’m probably guilty of a whole bunch of times. Vladimir Putin once said that the collapse of the Soviet Union was a catastrophe. Well, it really wasn’t, in that the Soviet Union was pretty awful regime, but I’m coming to realize that maybe everyone has at least one redeeming quality. Maybe the USSR’s was that for all the evil it did, it managed to set a limit on what the American ruling class felt free to do overseas. As long as Russia was a Superpower, we didn’t dare risk a confrontation with them, and avoiding that sometimes limited our freedom of action, and considering what’s gone down since the Cold War ended, that wasn’t an entirely bad thing. With the USSR gone, the People In Charge don’t have to worry (Or don’t think they have to worry) that a given action might escalate into a general war with Russia. And while Russia is no longer a Superpower it still has a nuclear arsenal, and given the state of their conventional forces, they sometimes don’t have much more than that. Maybe today they could only destroy us fifteen times over instead of fifty, but even so. And why in God’s name do we care which bunch of kleptocrats rules the Ukraine? And no, we aren’t going to put the Russians out of their naval base in the Crimea, and it’s not like they have all that much navy to base there anyway. The returns don’t justify the risks these lunatics are apparently willing to take. At the least, they’re giving Trump an extended lease on life by convincing people that removing him might well be worse than the alternative. At worst, this ends in blood and fire. End of rant, I swear. Quite a welcome comment. Certainly on topic and not too long. This is an EXCELLENT article! I wish every American would read this. The drumbeat for war (or at least conflict) with Russia is disturbing, all the more so because it is coming from both parties. There are a few exceptions however. Last night I noticed that Tucker Carlson was questioning why we still need NATO, and need it to expand, decades after the end of the cold war. I don’t know if it is possible to catch a repeat, but if so I think you would find it interesting. I should have searched first. Here is the segment. The great and wise have long advocated more bipartisanship. Now we have it! Both parties advocate for our long war, more domestic surveillance, and a new Cold War. How wonderful! Trump ripped up the Iran deal, drones more people than Obama, and made John Bolton his Nat’l Security Advisor. Not sure why a neocon would feel party-less since Trump’s given them just about everything they could hope for. Not just Bolton. Trump’s entire national security team consists almost entirely of military, defense contractors, and neocons. It’s all that the most hard-right GOP could ask for. What’s your source for that? Yemen and Somalia are growth stories for our military, a trend began under Obama. But I’ve not found (from a light search) good annual numbers for Afghanistan. Looking at only a few nations, as Trump-haters do, gives a misleading story. It would not surprise me to learn that Trump is killing more than Obama. That was his announced policy — with an emphasis on killing more civilians. I spent several minutes attempting to make sense of the claims in that article. Many of the relevant links go to other MERIP posts, in a self-referential circle. The most often cited was “Trump’s Secret War? US Military’s Presence in Middle East Has Grown by 33 Percent in Past Four Months,” – which returns nothing on Google. Also, not giving the URL is IMO a major red flag. I didn’t see any self-referential references, it’s all major English-language news sources, academic books and journals in the footnotes… The source text is lifted from a printed journal article so it’s not going to have URLs but the ref. articles are easy enough to find with google. A bunch of other major publications (Newsweek, WP, Rolling Stone, etc) have carried articles saying the same thing about Trump’s escalated drone war. Good luck googling. Their links all go to their website. As I said, the most frequently cited article returns “not found on Google.” That doesn’t encourage me to go father, or treat the site as authoritative. I’d never tolerate that on an article submitted here. Sorry, but I’m gonna have to say not finding the refs is more of a user error issue than anything else. Just google the title of the article you were looking for and it should be the first or second search result. If you want a site with links (“Dentists hate this man!”) choose one of the Newsweek or WP references from MER and google the title to get the article on the original news site. Since I gave you the title and you googled something else — something quite irrelevant to the astounding claim you made — is pretty much an ender to this conversation. Doing so and declaring it my error — when you could have as easily tested it yourself — is just odd. First page google result for that article too, surprise, surprise. That’s interesting. I searched, as sop, for the exact headline — which returns nothing found. You searched for the words, without quotes, and found it. While true, it is misleading. Obama ramped up the Af war when he came into office, then eventually turned down the flame (just in time for the election). They’re condemning Trump for following the same pattern. It would be more useful to compare our wars under Obama and Trump at same points in time, or perhaps vs. the average or peak under Obama. I did find the cite for the five-fold (4.3x) increase in drone strikes” CFR’s “The (Not-So) Peaceful Transition of Power: Trump’s Drone Strikes Outpace Obama.” It’s Obama’s average vs the first 45 days of Trump. That’s very misleading. You’d have a point if the MER article or one of its thirty references like the Newsweek one built its case on one statistic. Of course, none of those articles did that nor have the dozens of reports that have come out since that article in 2017. Trump’s already killed more civilians than Obama in wars against ISIS, launched a record number of airstrikes in Yeman and Somalia, and loosened restrictions on drone strikes outside armed conflict zones. When you add the fact that Trump’s relenquished civilian oversight and delegated authority to lower ranking officers to authorize strikes, the numbers indicating an escalation of the US drone war make quite a bit of sense. And the secretive legal framework the Trump admin has made even more secretive… And the increased size of munitions used on densely populated urban areas… And on and on. All of this has been documented by the excellent reporting that can be found online. It’s not only numbers but a pretty detailed accounting of the policy, legal, political, and military aspects of Trump’s drone policy. Articles discussing the numbers within that broader body of evidence are actually useful. Opining on which statistic is “more useful” while steadfastly ignoring that large body of evidence is what’s actually misleading. And curious. Maybe that unwillingness to engage with the larger picture or do even the most basic legwork like googling news articles is why this site is linked to and discussed so seldom in the blogosphere. I hope the deep state didn’t kill you? Haven’t seen any new post for couple of days. Let your reader know nothing happened to you. The election of Donald Trump opens the door to change and reform in many areas. The most important, in terms of our country’s future, is grand strategy and foreign policy (the latter, understood correctly, is a subset of the former). The United States needs a grand strategy aimed at preserving the state system. Our present grand strategy was conceived in a world of states in conflict with each other. Its purpose is to make America dominant over all other states. The U.S. is not the first state to attempt this. Like its predecessors, it is failing. No state has ever been powerful enough to establish the “universal monarchy”, as it was once known. Attempts to do so have always resulted in overreach, then fall. Remember, Portugal once ruled half the world. But the most important thing is not that we reduce our goals to match our power in the world of conflict between states. The most important thing is that we realize Fourth Generation war poses so serious a threat to the whole state system that conflict between states has become obsolete. We need an alliance of all states against Fourth Generation entities. If we and other Great Powers, especially Russia and China, continue to squabble among ourselves, the 21st century is likely to witness the end of the whole state system. Mere anarchy will be loosed upon the world. President-elect Donald Trump has already spoken with the leaders of Russia and China, telling them he wants better relations with both. That is a promising start. An alliance of all states should begin with a Triple Alliance of the three strongest Great Powers. Britain and France will probably join. Those five (who conveniently make up the permanent membership of the U.N. Security Council) should be the policy-makers. Any more and decisions will become impossible. I do not know whether President-elect Trump or his advisors understand the context within which we need a new Triple Alliance or Quintuple Alliance, and here as so often in grand strategy context is important. It is, again, the need for all states to work together against Fourth Generation, non-state entities that wage war. The alliance is a means, not an end. The end is that whenever 4GW manifests itself, wherever it does so, all states work together to defeat it. The power of Fourth Generation entities, or at least some of them, at the moral level of war is so great that, even with all the states in the world against them, beating them will not be easy. Let me say it once more: what is at stake in the 21st century is the state system itself. If events remain on their current course, by the year 2100 the state will probably be just a memory (a fond one, as in Syria, Libya, and Iraq) in much of the world. States have never played for bigger stakes. A corollary of a grand strategy that unites all states against violent non-state entities is that war between states must disappear. Too often, the losing state will disintegrate, creating a new petri dish of 4GW entities that is a far worse threat than the old state could ever be. Therefore, the new alliance of all states will work assiduously to avoid and prevent wars between states. Any state that appears to be moving toward war with another state will find the whole world in its path yelling “Stop!” Ironically, this Realpolitik may do more to prevent interstate conflict than have all the “peace movements” led by idealists. Some may ask, what about Iran, North Korea, and other “rogue” states? Do we want them in this alliance? Yes. “All states” means just that. Iran faces 4GW threats from non-Persians within her borders. North Korea does not face a 4GW threat, but she could be a useful ally, and we do not want her providing arms and expertise to non-state entities because of a desperate need for cash. A peace treaty with North Korea, followed by the removal of U.S. troops from South Korea, is just the kind of deal President Trump should be good at making. I hope the Trump White House will take a serious look at revamping America’s grand strategy so it fits a century where the most dangerous threat will be Fourth Generation war. There is at least a chance it will do so. Under Hillary, or any other Establishment president of either party, there would be no chance at all. by 90 percent and, equally telling, meat and dairy livestock herds by 75 percent. . . .
(London), January 27, 1994, p. 2. [Public Policy and Social Conditions] published yesterday. . . .
were up 9 per cent in Romania, 12 per cent in Bulgaria and 32 per cent in Russia. with a curious omission: the economic “reforms” which the paper so strongly advocated. Prospect, Spring 1993, pp. 87f. disillusioned by what they see as a string of unfulfilled promises from the West”). work, as well as a national health service, housing, education, and other services”). I think Lind was referring to the 10s of millions of deaths in the Great Terror, the Holodomor, and the Gulag. (((Cohen))) carrying water for such a regime? Who’d have thought? 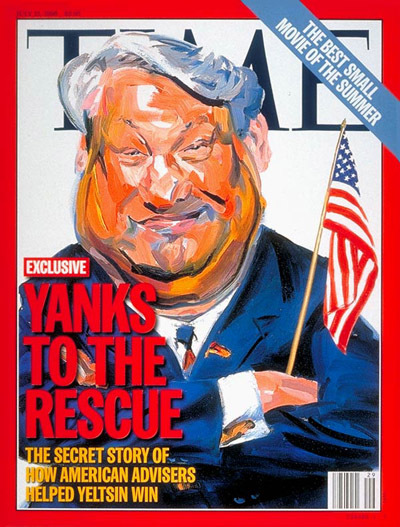 Everyone knows the collapse was bad, especially under Yeltsin. It doesn’t surprise me that our Harvard/Yale/Princeton regime bungled the aftermath of the collapse as they do everything else. That doesn’t change the murderous reality of the USSR.